Pioneers in the industry, we offer keratin hair extensions from India. Backed by a team of skilled professionals and a well-equipped production unit, we are able to offer an exceptional quality range of Keratin Hair Extensions that are available in various lengths and colors. The offered hair extensions are highly appreciated by our clients owing to natural shine, smooth texture and long lasting finish. 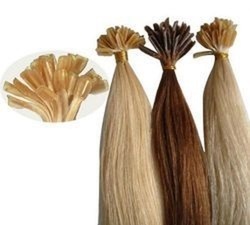 These hair extensions are processed at our hygienically maintained production unit with the use of natural human hair. Used for try new looks, our clients can purchase the hair extensions from us in a multitude of colors and textures to cater their variegated requirements.